There is no consensus on what is best to use for (men’s) shaving: electric shavers or traditional manual razors. In this question everyone has his own best-shaving solution. For example, my father tried several times a high-quality Braun series electric razor, but found that “old-school” shaving with manual razors suits him best. But for me it was vice versa: since I first tried to use electric razors more than a decade ago, I have never used manual razors anymore (except a few situations when I simply forgot to take my electric shaver on a trip). And for many of my friends, it’s the same story – they also think that electric razors rock! So let’s find what the best electric shavers are now. There are a lot of different electric shavers on the market. I researched and compared many-many of them and, in this article, you will find the list and reviews of the top electric shavers for 2017. A quick note: remember that electric razor is a very personal device. So, while one shaver will suit one man better, another model may be better suited for someone else. All of the presented below models are high quality with hundreds and thousands of positive reviews, so no matter which one you will choose – you will not be disappointed with its quality and shaving comfort. Well, the Braun is what I personally use for more than 5 years. I don’t own this modern Series 7 model though – my shaving device currently is Series 5. I have nothing but good words regarding my shaver, but here I would like to review this electric razor as unbiased as possible – as if I had never used any razors by Braun before. 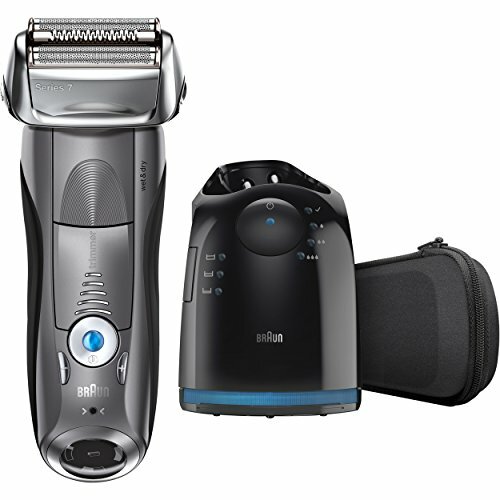 Braun Series 7 is also called Pulsonic Shaver System. The Pulsonic has an ergonomic design and it perfectly lies in the hand. There are two sections of black rubber on the sides of the shaver for more secure hold. The foil-style shaver is located at the top of the grip and can flex and pivot for more comfortable shaving. At the bottom of the shaver is an LCD display that shows all the important information: battery status, amount of time needed for charging and a notice of the need for cleaning at the station. On the front of the shaver is a trimmer which opens when you click on the suggestive word “Trimmer”. As well as Braun Series 5, these Pulsonic shavers are also 100% waterproof and can withstand water pressure up to 5 meters. Sure, the shaver is also completely washable and can be rinsed under the tap. 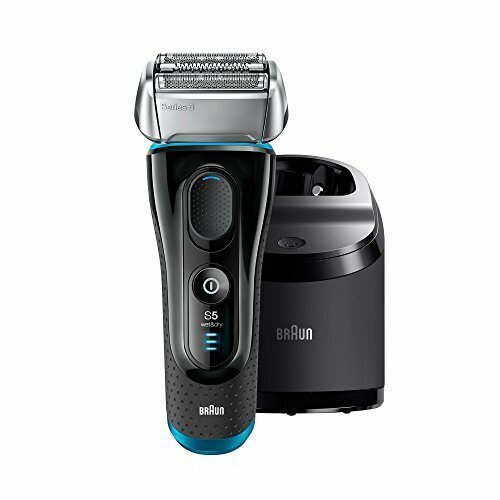 This shaver uses Braun’s Sonic technology that automatically adapts and adjusts the power based on the read characteristics of the beard. You can also choose between five different shaving modes depending on the needs, preferences and skin type. The shaver’s head is fully flexible and it moves and adapts to the individual skin. The 790cc model comes with 5-action Clean and Charge station that does a similar process as the cleaning station of Braun 5 Series – it hygienically cleans, charges and lubricates the shaver. The battery of the Pulsonic provides up to 50 minutes of cordless shaving and it fully recharges in one hour. If you ask me to describe this shaver in one sentence, I would say: Braun is Braun. Incredible comfort, many useful technologies, great design and reliability and these all in one package. 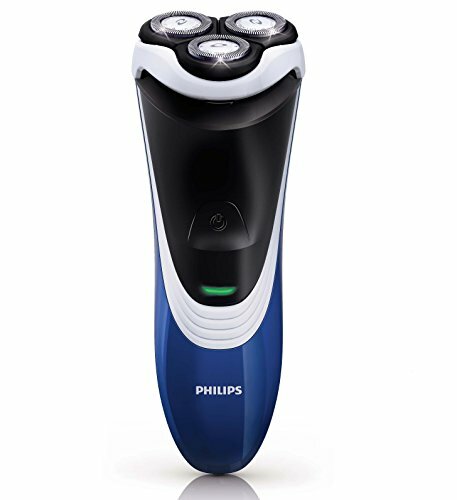 The Philips Norelco 9700 is a top electric shaver that is equipped with many up-to-date technologies and provides outstanding shaving experience. The S9721/87 model comes with the SmartClean Plus station that cleans, dries, lubricates and charges the shaver. The shaver is made in a graceful black color with an attractive and effective design and ergonomic grip. The shaver’s head moves in 8 directions and helps to achieve closer shaving. To be more precise, there are 3 shaving heads that work separately and each of them can move in eight directions – it provides a better slip on the contour of the face and leads to more efficient shave without irritation. Philips uses V-Track self-sharpen blades inside each head and these blades also contribute to a more comfortable shave that is, as Philips claims, up to 30 percent closer than most other electric shavers. Norelco 9700 shaver can be used wet and dry, so shaving foams and gels are welcome to use. The shaver can also be used in the shower and, even though this particular model comes with a cleaning station, it’s pretty easy to clean the heads under running water. Inside the Norelco S9721/87 shaver is a Lithium-Ion battery that provides up to 60 minutes of cordless shaving and it takes 1 hour to fully charge it. A quick five-minute charge will be enough for one full shave, which is useful in case when you forget to charge the shaver. On the front side of the shaver is a digital user interface that also includes a built-in motion sensor. This interface displays battery level in percentage, battery low status, cleaning indicator, replacement head and a travel lock indicators. And, of course, this shaver also has a trimmer which is called SmartClick Precision trimmer. Norelco S9721/87 has several different speed settings, so anyone will find his best personal experience during shaving. The price for this shaver is pretty high, but the Philips Norelco S9721/87 is definitely one of the best electric shavers available on the market. This electric razor has some unique features that help to achieve comfort and smooth close shave. One of those features is Panasonic’s Multi-Flex pivoting head that provides smooth shaving on the face and neck. Stainless-steel foils also have a desing that follows facial contours for better comfort and closeness. The Panasonic Arc4 is 100% washable electric razor and can be used wet or dry. There is a pop-up trimmer for grooming on the back side of the shaver. This razor is equipped with Sonic vibration cleaning mode that helps to rinse away debris during rinsing the shaver under the stream of water. On the LCD display, which is located on the front of the razor, are a charging/battery’s status indicator and an indicator that tells when to clean the shaver. The display will also suggest when to change the blades. Panasonic Arc4 has four cutting blades that are angled at 30-degrees – it provides cutting the hair at its base for a closer shave. These blades are also made with hypoallergenic steel. Summing up the line, I will confidently say that the Panasonic Arc4 is a great electric shaver with a reasonable price that will suit the vast majority of men. Overall, you can’t go wrong with Braun – no matter what. Of course, one model will suit you better than another, but, in general, all the modern electric shavers made by this famous German electronics manufacturer are the right choice. Let’s take a closer look at the Braun Series 5 shavers. Braun Series 5 comes in two colors – it’s black or black/blue combination. For someone it may look not as brutal as some models by other brands (though, I do like its design), but it has nothing to do with how this shaver do the job and what feelings it provides during shaving. This 5 Series models have several technologies that help to ensure the highest comfort of shaving. One of them is the AutoSense Technology that adjusts the power of the shaver by reading the beard’s thickness – these adjustments are carried out 13 times per minute. This allows to complete shaving with fewer strokes which is always good for our skin. The shaver’s head flexes in 8 directions – it provides maximum skin contact for less irritation and pressure. Braun company claims that Series 5 shaver is 100% waterproof and can be submerged in up to 5 meter deep water. It means that you can easily clean it under running water and use the shaver both in the sink and in the shower, without worrying about the possible impact of water flow. With all the features that Braun Series 5 has it would be strange if it didn’t support wet & dry shaving. So, of course, this razor can be safely used with gel or foam. And even though I prefer dry shaving, I’m pretty sure that there are many men who can’t imagine shaving process without foam, soap or cream – so it’s definitely a very important feature that, in my opinion, nowadays any electric shaver must have. On the front side of the shaver you will find LED display which indicates battery status, travel lock and hygiene. On the back side is a slide-up trimmer. The Li-Ion battery provides up to 45 minutes of cordless shaving and it takes 1 hour for full charge. Depending on the model of the Braun Series 5, there is a cleaning station in the package (5090cc has it). This is a 4-action station that at first hygienically cleans the shaver’s head with alcohol-based fluid, then charges the battery and lubricates all the moving parts of the shaver. Braun declares that using the Clean & Charge Station is 10x more hygienic than just washing the shaver under running water. As a final word about Braun Series 5 shaver, I can only say that it’s a modern and comfortable electric razor that is equipped with all the latest technologies and made with the inherent reliability of the Braun company. If you prefer to clean the shaver under the tap and don’t need a cleaning station (like me), there is also the ** Series 5 model which comes without the station. Another great razor by Panasonic in our list is the ES-LF51-A model. As well as the ES-LA63-S, this model is also applicable for wet & dry use and 100% waterproof. In fact, there are many features here that are the same as in the ES-LA63-S model, though there are a few differences as well. The Panasonic ES-LF51-A shaver has 4 blades which are tilted by 30 degrees – as well as in the ES-LA63-S, it’s made for more comfort and close shave. The shaver also has a flexible pivoting head that smoothly follows the contour of the face and reduces possible skin irritation. There is a pop-up trimmer on the back side of the razor. On the front of the razor is a LED indicator which informs about battery level and helps to choose one of the five different levels of shaving. This LED indicator is one of this model’s differencies from Arc4, in which the indicator is LCD (but, honestly, for me it doesn’t matter at all because both types successfully fulfill their basic function). On the front side of the shaver above the indicator is located a lock switcher which can be useful when you need to make sure that it will not accidentally turn on when it’s not needed. Due to its wet & dry compatibility, with the ES-LF51-A you can use foams, gels and lotions for shaving. The shaver is very easy to clean under the tap and there is also a Sonic Vibration cleaning mode that makes the process even more simple. Just like Panasonic ES-LA63-S, the ES-LF51-A is a superior compact razor with a moderate price, that is unlikely to disappoint anyone. Remington is a well-known and reliable brand. The history of the company starts from 1816, but the origin of their personal care products dates back to 1937, when the company (it was called the Remington Rand at that moment) began to create electric shavers. So, we can clearly see that this company has a really great experience in creation of electric razors. One of the biggest (but not the only one) advantage of the F5-5800 shaver is its affordable price. The shaver doesn’t have as many super extra features as most top electric shavers have, but if we are talking about clean, effective shave in the first place, then everything is perfect in this electric razor. It does the job extremely well and it’s doubly nice considering the shaver’s price. 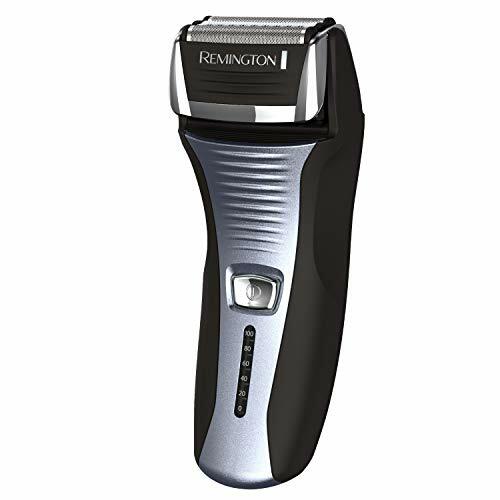 The Remington F5-5800 is a foil-style shaver and its head is built with the company’s Pivot and Flex technology. The shaver supports both wet and dry shaving and it’s completely washable under the faucet. In my opinion, having wet & dry option in such an affordable model is a great thing, because not even all top and expensive models support both types of shaving. On the back side of the shaver is a pop-up trimmer and on the front there is a LED battery indicator under the power button. The battery provides up to 60 minutes of cordless runtime and has a quick 5-minute charge option. By the way, the shaver can be used both corded and cordless, so if it’s fully discharged and there is a socket you don’t have to wait even those quick 5 minutes to finish your shaving. All in all, despite a very affordable price, the Remington F5-5800 shaver provides great comfortable shaving experience. This is another shaver in our list with which no one will be dissapointed. Here is another Norelco shaver in our list and this is the 4500 model. Philips has been producing electric shavers since the beginning of the last century and, while one model differs in some features from another, all electric shavers made by Philips have a proven quality, reliability and efficiency. The Norelco 4500 (formerly called PowerTouch) shaver keeps all the important features and a quality of the Philips brand, but at the same time it doesn’t shine with some unnecessary technologies and therefore this model has an affordable price. This is a rotary-style shaver and its shaving heads, which is called DualPrecision, pivot to keep a close contact with the skin for fast and gentle shaving. It can be used for dry or wet shaving and it’s completely washable – you can simply hold the shaver under the tap to clean it. There is also a cleaning brush in the package that will help to clean shaving heads more carefully – when it’s necessary. The AT830 uses DualPrecision shaving system that is designed to shave both longer hair and short stubble more effectively. Pop-up trimmer is on board too and it’s very convenient for trimming goatees, mustaches and sideburns. The shaver is also equipped with Super Lift & Cut dual-action blades that lift hair and help to effectively cut hair below the skin level. With one hour of charging the battery of Norelco AT830 provides about 50 minutes of cordless shaving. A quick-charge option is also here. There is a LED indicator on the front of the shaver that informs about charging level. 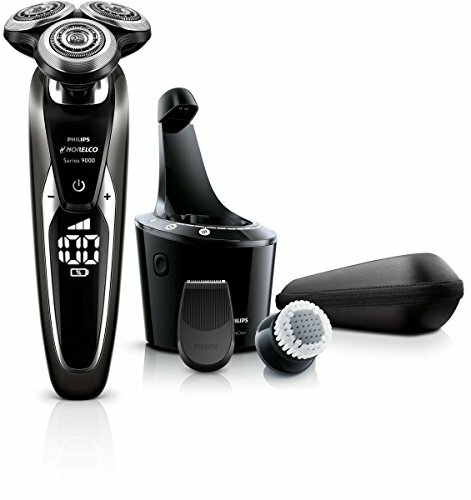 Summing up, the Philips Norelco 4500 AT830/41 model is a good shaver that provides a clean and comfortable shaving experience. If you don’t need accessories like cleaning and charging station, AT830 will be a great choice at an excellent price. The Braun M90 is an affordable electric shaver with very compact dimensions. 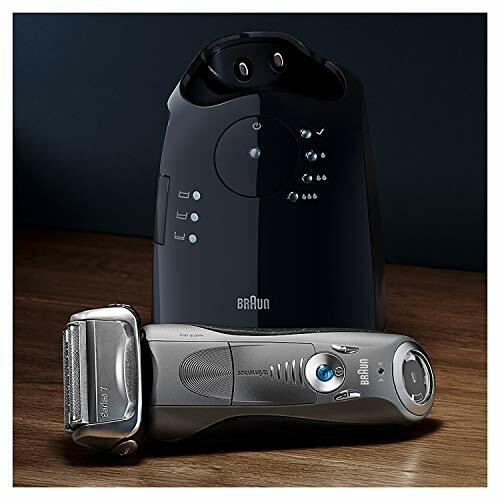 As it’s typical to all Braun’s devices, despite the low cost this shaver is made with high quality and provides comfortable and clean shaving. One key difference that distinguishes this model from most others electric shavers is that the M90 uses standard replaceable batteries instead of a built-in rechargeable one. It’s hard to say unequivocally whether using conventional batteries is an advantage or disadvantage. Personally, I would say that it’s rather a disadvantage, but I’m sure there are many men who will say the opposite, because in some situations and depending on lifestyle the ability to buy batteries anywhere and insert them in the electric shaver may definitely help. Also, it’s always possible to buy and use standard rechargeable AA batteries with this shaver, so, all in all, at least it’s not that bad. 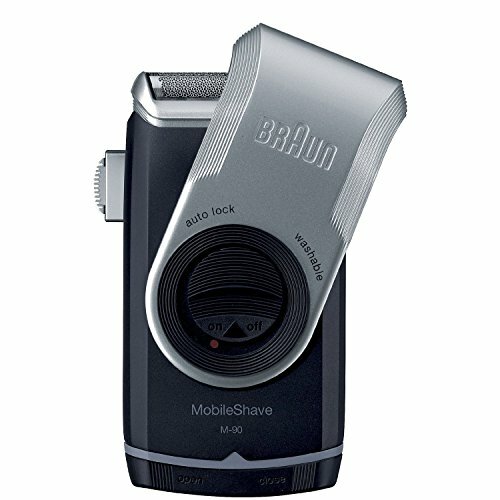 The Braun M90 Mobile shaver is a foil-style electric razor with a rotatable cover (Braun calls it Twist Cap) that protects the shaver’s head while carrying. The Flexible SmartFoil helps to achieve more comfortable and close shave by adjusting to the contours of the face. The shaver is fully washable and can be easily cleaned under running water. The M90 MobileShave is also equipped with a slide-out long hair trimmer, so you can trim beard and sideburns with this razor as well. Braun did a good job creating this electric razor which provides effective, comfort and close shaving. If you travel a lot and need some inexpensive portable electric shaver, then Braun M90 will be the right choice. With replaceable batteries this shaver can be truly used, what is called, “on the go”. The Philips company is one of the leaders in electric razors area. They have all the range of different shavers – from simple and inexpensive models to more premium ones. The Philips Norelco Shaver 3100 (formerly called PowerTouch) is an affordable waterproof razor that provides great shaving experience. It’s a rotary shaver and the rotary head here is also a part of the shaver – which is not common for rotary shavers created by other brands (where it’s usually a separate part). Norelco 3100’s Lithium-ion battery allows to shave up to 40 minutes and it takes 8 hours for full charge. And, of course, there is a charging indicator on the front of the shaver that keeps you informed of the battery’s status. The shaver has a fully washable head, which makes washing very convenient under the tap. It’s fully waterproof so you can use the shaver in the shower or in the sink without worrying about ingress of water. There is a cleaning brush included in 3100’s package, so you can use it in addition to rinsing under the tap when necessary. Norelco 3100 has Philips patented ComfortCut Heads – it means that its heads have rounded edges with gliding effect. This design provides more comfort while shaving and allows to glide more smoothly, which, in turn, reduces skin irritation. These heads also provide a closer shave – up to 66% closer than other brands as claimed by Philips. There is also a quick charge option which may be useful if you forget to charge the shaver – just charge it for three minutes and it will give enough power for one full shaving procedure. At the back of this Norelco shaver is a pop-up trimmer that, as usually, can be used on some other types of hair where main shaving heads can’t do the job or simply are not combortable to use. The shaver is lightweight, compact and very convenient to use during traveling. The Philips Norelco OneBlade is all-in-one electric trimmer and shaver. It’s very different from all other shavers and you can see it even from a photo – OneBlade’s design is a brand new and unusual for electric razors. This shaver/trimmer will be suitable for men who have any kind of facial hair – stubble, mustache, sideburns and beard. The Philips’ goal of creating the Norelco OneBlade was to provide men with one shaving tool that does different tasks – it was specifically designed for men who grow beards and wear facial styles. With OneBlade you can shave, trim and create edges and lines regardless of hair length. So this electric shaver may really replace several shaving tools. OneBlade shaves not too close, so it provides comfort and allows to shave hair of any lenght. The shaver comes with three click-on combs – 1, 3 and 5mm, so you can choose the best one depending on your needs. The OneBlade can be used dry or wet, so foams and gels can also supplement shaving. This shaver has the dual-sided blade, so you can shave in both directions. OneBlade is water resistant and can be easily cleaned under the tap. The OneBlade has a NiMH battery that gives about 45 minutes of cordless shaving. The downside of the battery is that it takes 8 hours for full charge. 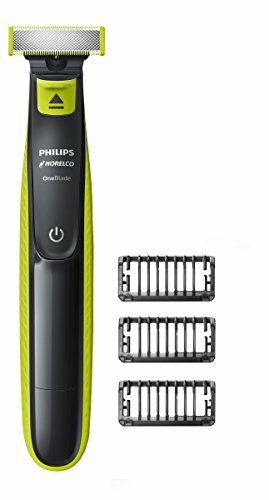 Philips Norelco OneBlade has an affordable price and this is really an interesting hybrid shaver which will perfectly suit men who often trim their facial hair. There are two main types of electric shavers – foil-style and rotary-style. Both types are effective, but they have some differences and each of them has its own advantages and disadvantages. Foil shavers provide closer and smoother shave than rotary shavers, but at the same time, rotary shavers follow the contours of the face much better than foil shavers (simply due to its design and pivot heads). There is no the only best option between rotary and foil shavers. Each type has its own advantages, so everyone should decide for themselves what is most important – to have a closer shaving or to have a shaver that better follows the facial contours. But I’m sure of one thing: no matter what type you will decide to buy and use, if you use one of the modern electric shavers (e.g. any model from the list above), you won’t be disappointed, because top manufactures always care about their customers and constantly improve their models in such a way as to reduce disadvantages of each type while keeping and improving its benefits. You might have noticed that most shavers in the list above support both types of shaving – dry shaving without using water or any other liquid, and wet shaving where you can add shaving gel, cream, foam, soaps, water and so on. There is a simple reason why manufacturers equip their electric shavers with this feature – simply because, again, there is no “right or wrong” thing regarding wet or dry shaving, it depends on the personal preferences of each man and companies just want to (reasonably) expand the number of their customers. Wet shaving doesn’t mean just an ability to use water – it means that you can add foams, shaving creams, soaps, lotions or gels during the shaving. 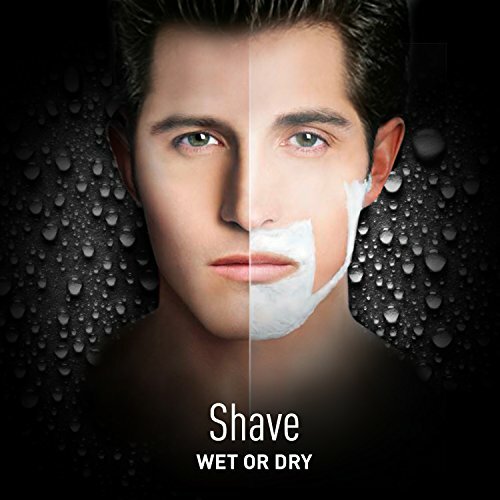 So, if you prefer wet shaving, before buying an electric shaver make sure that it does support true Wet & Dry option and it’s not just a water-resistant shaver that works only with water, but doesn’t allow using shaving creams. Cordless shaving simply means using an electric shaver on batteries without connecting to a stationary power source (e.g. household sockets). Most modern electric shavers don’t support corded shaving (while plugging in) – it’s done for safety reasons, so people are safe from electric shock. At the same time, most electric razors now have fast charging time and some of them have a quick charge when only 3-5 minutes of charging is enough for a full shave. So, even though corded shaving is convenient in certain situations, I would say that shavers that support cordless shaving only are better, because human safety should always be in the foreground. If you are using plugged electric shaver just make sure you’re doing it safely – avoid any water or moisture. Some of the models mentioned in this article come with a cleaning & charging stations. This cleaning stations simplify shaver’s cleaning and maintenance. In most cases, the cleaning station not only cleans and charges the electric shaver, but also lubricates moving parts of shaver’s head. The only disadvantage of cleaning stations is in additional expenses – you will pay more for a shaver that comes with cleaning station (or buy a station separately) and also you will have to regularly purchase containers with cleaning fluid (usually it’s an alcohol-based fluid). Even though cleaning stations definitely make the whole cleaning/lubricating process easier, there is nothing complicated in manual cleaning of the electric razor. Just make sure that the shaver supports washing its shaving head (or heads) under running water (all of the above-mentioned shavers support it) and you will be able to easily clean it after each shave in just 20-30 seconds. There are things we have to do regularly at home without exceptions: it’s cooking/eating, laundry/washing and, without doubts, cleaning. And while we can eat and wash things in the laundry outside our house, we definitely can’t clean our home somewhere outside it, right? Well, of course, that’s right that we can’t do the cleaning by ourselves when we are away, but we can still keep our house clean while we are somewhere outside of it. There are two simple options for that: we can outsource cleaning or we can use robots. Each option has its pros and cons, but in this article I’ll cover the most cost-effective method – robot vacuums. Below are the list and quick reviews of the best robot vacuums currently available. Before purchasing you may want to read our buyer’s guide where you will find useful information about the differences, some features and what you should know and consider before buying. ILIFE company creates robots for over 10 years. Their products are affordable and have tons of positive reviews. This model doesn’t support Wi-Fi and has no app, but this robot’s price/quality ratio is amazing and currently the best among all other robotic vacuums – that’s why we chose it as our best-of-all pick. ILIFE A4s is the updated version of previous top-rated A4 model – you can see the comparative table below (click to expand). A4s has a Li-ion battery on board that provides up to 140 minutes of cleaning time and, according to the manufacturer, it covers up to 2100 sq. ft on a single charge. When charging ends, the robot automatically docks and charges then return to finish the cleaning. ILIFE A4s has a new feature which A4 model doesn’t have – it’s called mini-room mode. With this mode, A4s cleans the room more precisely and diligently by using its advanced algorithm. This is a useful feature when you need to clean some separate rooms instead of the whole house. There are also other cleaning modes that allow you to adjust the cleaner according to your needs: edge cleaning mode, max cleaning mode, auto cleaning, spot cleaning and schedule cleaning modes. Scheduling can be configured through the remote control. A4s has double V-shaped bristle brush that provides more efficient cleaning by picking up more dirt, crumbs, dust mites and cereal. With the Max cleaning mode, which can be enabled on the remote controller, A4s robot will clean the house with its maximum pickup power. At the moment of publishing this article there was a discount for ILIFE A4s on Amazon which makes this robot vacuum is the best one for its price. Botvac Connected is a Wi-Fi enabled cleaner. Neato’s smartphone and tablet app allows you to monitor, control and schedule the cleaner. You can set it remotely, clean the whole house or choose some specific area and get notification about the vacuuming status. There are two different modes: Turbo mode for a powerful cleaning with max absorption and Eco mode for a quiet, gentle vacuuming. In its Turbo mode, the Botvac robot is as loud as most vacuum cleaners, but it picks up debris better than most of the other robots as well. Botvac Connected comes with two brushes: the combo brush and spiral blade brush, which are suitable for a variety of spaces and surfaces. It also includes the new filter which provides great performance and is easy to pull out and clean. CornerClever technology and D-Shape design help to clean close to objects, walls and into corners. There is also a LaserSmart navigation that increases the coverage area. This Neato model works with Amazon Alexa – so you can run and control it using your voice. Those who had ever been interested in robot vacuums should have definitely heard about iRobot products. Since the company launched their Roomba series almost twenty years ago, iRobot cleaners became best sellers – and there really is a reason for this. Roomba 980 is the latest model in its lineup and it comes with all the modern technologies and features. The robot runs for about 120 minutes and then automatically returns to doc station and recharges. This iRobot is also equipped with iAdapt Responsive Navigation (provides better navigation and avoiding stairs), has a low profile design to clean under the furniture and combined cleaning system which uses brushing, suction and agitation. Among many other features, 980 model has the AeroForce Cleaning System which automatically increase the power on carpets – where it’s harder to pick up dirt and dust. 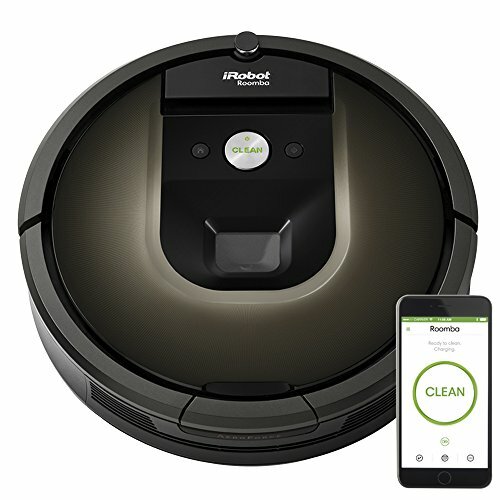 Like many other modern robot vacuums, iRobot has its own Home App that allows to conveniently start and schedule cleaning from wherever you are. The Roomba rockstar, which has been well-known and recognized for many years by thousands of people around the world, now just surpassed itself with its new 980 “hit”. POWERbot R9350 Turbo is the successor of the previous model VR9000. I would like to note that R9350 is the most expensive and the most technically advanced model currently, so you may want to compare between other POWERbot robots to see which one would suit you – on this page you can find a comparison table with different models and their specs. R9350 has a digital camera and nine smart sensors on board that help the robot to find the optimal cleaning route. 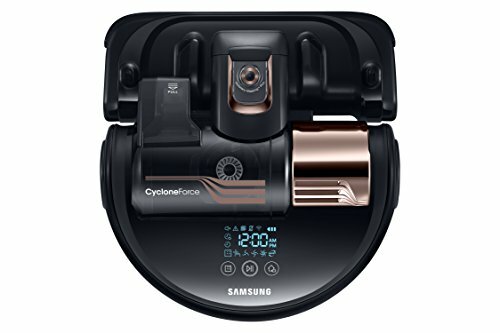 Samsung states on their official site that the POWERbot Turbo has 70x more suction power than the leading robot vacuum according to NPD, 2015. In other words, it has enough power to clean the whole house and different surfaces really well. This model supports Wi-Fi and can be controlled remotely via Samsung’s Select & Go mobile app. There is an option called “Point Cleaning” – it allows to point the exact place for vacuum cleaning. Amazon Alexa is supported in R9350 too. What I’d also like to emphasize regarding this robot vacuum is that Samsung provides 10-years warranty on motor – which is more than solid and (for me) causes respect for the manufacturer. bObi is the newest model of bObsweep manufacturer who creates affordable yet efficient robot vacuums. For about $300 this beautifully designed cleaner has many high-end features on board: auto docks & recharges, cleaning scheduling and customization via remote, HEPA filter, UV sterilizer. This is a multi-tasking cleaner: vacuuming, mopping, sweeping, UV sterilization and Hepa filtration – bObi does these all. I personally very like the design – it’s clean, light and beauty. Another positive thing is that bObi is quieter (yet powerful) than most robot vacuums. 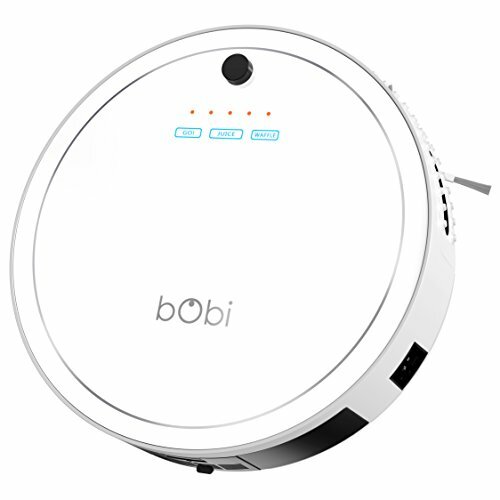 bObi doesn’t have physical or virtual boundary markers to direct the vacuum cleaner – which in my opinion is absolutely “ok” considering its low and highly competitive price. 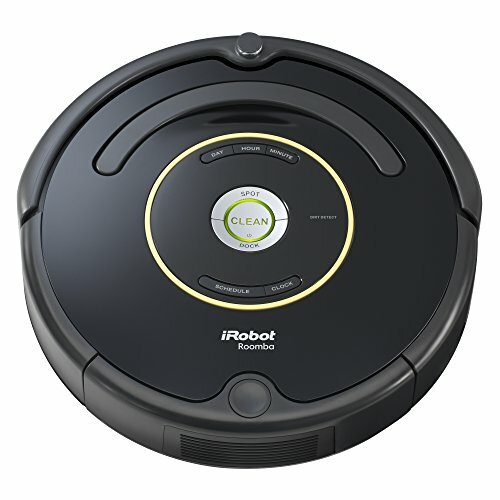 Meet the absolute best seller – Roomba 650. It has so many positive reviews across the world and the web that it’s hard to be wrong in choice if you decide to purchase this robot. We’ve already covered the latest Roomba 980 – the most modern iRobot model currently. But Roomba 650 is more than twice cheaper than 980 and, despite the fact that it’s not a new model, it remains excellent and competitive robot vacuum. You can see the difference between two models in the table below (click to expand). Roomba 650 has a 3-stage cleaning system that is designed to pick up easily any kind of pollution by agitating, brushing and suctioning. With its 3.6 inches tall the robot can clean under most furniture. Other features included: iAdapt Navigation (set of sensors to navigate smarter among household items), automatic docking and recharging, auto adjusting to different floor surfaces (tile, laminate, hardwood, carpet and others), scheduling (preset to run up to 7 times per week). Honestly, with its current price it’s very diffucult to find any objective downsides of Roomba 650. It’s just a great and affordable vacuum cleaner that makes his job extremely well. 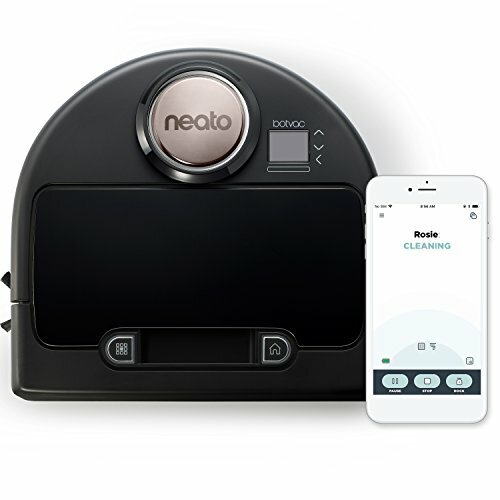 Another good robot vacuum by Neato, but much less expensive than the Botvac Connected model. Although this is a more affordable robot, the XV Signature has all the important and useful features. With its square front XV Signature keeps close to corners, thereby increasing the overall cleaning area. As well as some other modern robots, the XV Signature automatically goes to the base, recharges and then resumes where it interrupted the vacuuming. The robot can also be scheduled for daily cleanings via its control center. XV uses patented Neato’s laser guided navigation which helps to scan the room, plan the most efficient path and avoid bumping around. 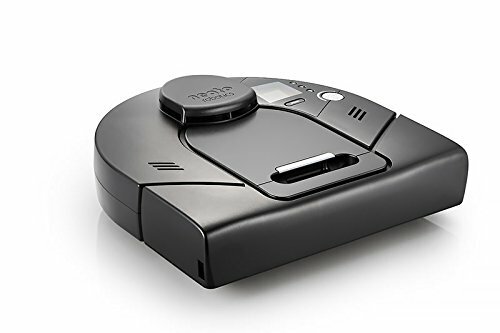 Neato Robotics XV Signature really is a good robot vacuum witn an affordable price which is built by reliable and well-known company. According to the World Health Organization house dust is the number one cause of allergic reactions in the home. That’s why having robot vacuum cleaner is a must for people who suffer from allergies and, at the same time, who wouldn’t like to vacuum manually every day. It’s clear that modern robot vacuums can significantly save time for their owners. However, I personally see one disadvantage in them for some people: it’s a possible decrease in physical activity. With conventional (manual) vacuum cleaners we have to move – and, even though it takes our time, it’s good for health. So, while using robot vacuums for home cleaning, I strongly recommend everyone to make sure that you devote enough time for sports, outdoors, fitness, yoga, walking or any other physical activities. HEPA is a type of highly efficient air filters which must remove 99.97% of particles that have a size of 0.3 micrometers in diameter (in accordance with the US government standards). Unlike some other filtrations – such as Ozone and Ionic – HEPA filtration is safer because it uses mechanical means, so the risk of potential lung diseases and side-effects like allergies or asthma is much lower. HEPA filter presence in vacuum cleaner can be crucial for people with allergies or asthma, because the filter is able to trap the fine particles such as dust mites and pollen which cause the aforementioned symptoms. At the same time, not all vacuum cleaners that have a HEPA filter on board are similar in filtration efficiency, because there is also an important condition: a cleaner has to be designed in such a way that all the drawn air passes through the filter without any leaks elsewhere. So the best HEPA vacuum cleaners (in terms of filtration) are those that have labels like “True HEPA” or “Sealed HEPA”. You should know that some manufacturers mark their products as “HEPA-like”, “HEPA-type” and so on. It means that these products don’t satisfy the original HEPA’s requirements and, while some of these filters may have a close to true HEPA filtration efficiency, others will not have anything to do with HEPA. So, if you or your relatives have some kind of pulmonary ailments, make sure you deal with the true HEPA – it will provide you with fresh, clean air and have a positive impact on health. Do you have personal experience with the above mentioned or any other models of robot vacuums? Then, please, comment below and share your thoughts. The Dyson Ball Multi Floor 2 is an upright vacuum cleaner that is headlined by Dyson Ball Technology and the renounced suction power of Dyson vacuums. The machine aims to combine cleaning power with maneuverability and with a range of simple, yet helpful additions and features, it was clearly designed with ease of use at the forefront of considerations. Suction Power: Dyson vacuums are well known for their suction power, and the Dyson Ball Multi Floor 2 is no different. With a maximum suction power of 245 Air Watts, this machine is well above industry the industry average of about 180-200 Air Watts for the usual upright vacuum at this price point. When combined with the maneuverability that we will discuss shortly, this level of suction is market leading. Self-Adjusting Cleaner Head: Perhaps the most impressive feature of this model is the ability of the cleaner head to sense what type of flooring it is on in order to adjust performance. The head essentially adjusts its height from the ground depending on the surface it is on which optimizes cleaning performance, without the user having to do anything. This combines with Radial Root Cyclone technology and a High-Energy Particulate Arresting (HEPA) filter to remove the maximum level of dirt and dust from your home. High-Reach Wand and Attachments: The instant release high-reach wand allows the user to vacuum hard to reach areas that might normally require dusting. Additionally, by using the combination tool, a small attachment that clips onto the head of the wand, it is possible to vacuum shelves, window skirting and a range of other surfaces as part of your usual vacuum. The stair tool is another great innovation, which allows users to more easily and effectively vacuum stairs. Whole Machine HEPA Filtration: One notable feature that is particularly relevant to buyers with allergies or asthma is that the machine has whole machine HEPA certification. The machine has a HEPA filter, but more than that, Dyson has gone to the effort of proving that no air containing tiny, invisible particles of dust can escape from inside the machine, meaning it is a very suitable choice for those suffering from asthma, allergies, or other respiratory difficulties. These are the main features that are included in the machine which make it among the most technologically advanced and innovative options on the market. Whilst the main features of the Dyson Ball Multi Floor 2 are listed above, there are a number of small aspects of the machine that has a significant impact on the ease of use and subsequent level of cleaning. Power Cord: Whilst the machine is not cordless, which would be ideal, the power cord is over 30 feet long. This means that most apartments and small homes and can almost be vacuumed without having to use a second power point. Easy of Emptying and Cleaning: Whilst bagless technology is a mainstay of most vacuum cleaners these days, the ease of emptying the Dyson Ball Multi Floor 2 is next level. It is simply a matter of pulling a lever and allowing the dust to fall into your bin. This feature is particularly helpful given the amount of dirt the machine is capable of picking up. When it comes to cleaning the HEPA filter, simply washing it under running water is sufficient. Ball Technology: Dyson Ball Technology is almost synonymous with the brand itself. If you haven’t ever tried a Dyson with ball technology in your home before, the difference will be profound. The way in which the user can control the direction of the head of the vacuum with a twist of the wrist almost makes cleaning enjoyable. Whilst the suction capabilities are certainly impressive, it really is the maneuverability of the machine that allows this suction to work its magic across your entire house, including in corners, along walls and around furniture. These additional qualities demonstrate how Dyson has gone the extra mile with this machine to ensure that it is as user-friendly as possible. The ease of movement and emptying of the machine make cleaning quicker, easier and more effective. The size of the machine is generally what you would expect from a vacuum cleaner. One downside to it is that it is slightly heavier than you would expect from looking at it. Weighing around 16 lbs (7 kg) reduces the ease of movement somewhat, however, this is still only a few pounds heavier than lightweight options. In terms of storage, the ability for the cleaner to stand upright alone means it fits neatly into corners and cupboards. Unfortunately, there is no wall-hanging option as with some of the cordless vacuums in the Dyson range. Generally speaking, the Dyson Ball Multi Floor 2 is very competitively priced for its quality and features. It is a premium product that is at the forefront of its industry, however, it is a durable and reliable product of sturdy construction. Dyson has the sort of reputation that cannot be built on faulty or flimsy products. The exact price that you pay, and the associated delivery costs, will depend somewhat on your specific location, however, it should be very reasonable for what it is. If you are concerned about making such a big purchase, keep in mind that Dyson, and other retailers, may offer guarantees that offer some assurance. Dyson will also match the prices of its retailers even after you have purchased the machine if you find it cheaper, subject to terms. Overall, whether it be by a measure of vacuum power, user-friendliness or value for money, the Dyson Multi Floor 2 is a sophisticated, reliable, and easy to use the machine. It combines the suction capabilities for which its maker is renowned with the ability to vacuum almost any surface in your home through versatility and maneuverability. Its few faults are minor drawbacks in the grand scheme of things, and for its price, there are few better options on what is a very crowded market. For a quick summary of what we’ve covered, check out the table below for the key advantages and disadvantages of the Dyson Ball Multi Floor 2. This question arises in the mind of almost all the people when they decide to go to buy an Instant Pot: “Which Instant Pot size is good for me, Pot 6 or Pot 8?”. Nowadays, these Instant Pots are available in different sizes and are capable to perform various functions. What food you’re going to make? For whom you’re going to prepare the food? Yes, a lot! The first important thing to consider is that you cannot use all the space mentioned in the volume of the instant pot. For instance, if you’re using 6 Quart or 8 Quart, you cannot fill them up to the upper limit because you need some space for pressure, stirring and other similar things. Ideally, you can fill 75% of the instant pot with food items to cook. If you’re 1-2 family members, Instant Pot 6 Quart can satisfy all your basic food needs. It has the capacity of 6 liters. On the other hand, if you have a large family then you must go for Instant Pot 8 Quart which can hold 8 liters. If your family size is small, but you do batch cooking, then you must go for 8 Quart. Some people love to cook more food. For instance, if you want to cook one 5 to 6 pounds whole chicken, 6 quart is good but for 2 chicken of this size, you’ll have to use 8 Quart. You can prepare 5 to 6-quart yogurt in 6 Quart and 6 to 7 quart in 8 Quart Instant Pot. As far as the accessories are concerned, you can store good amount of them in both Pots but, obviously, the 8 Quart can hold more material than 6 Quart. Let’s do a direct comparison between the two models. 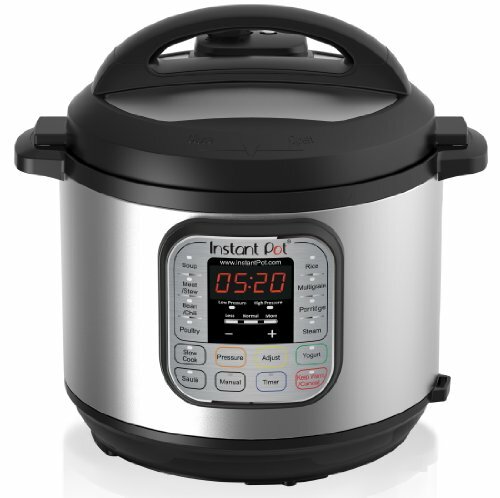 Of course, the 8 Quart Instant Pot is a little more expensive than Instant Pot IP-DUO60. Simply, it can prove a small burden on your pocket if you’re on a tight budget. So, we can conclude that 8 Quart is clearly more expensive than Instant Pot 6 Quart. The second issue with 8 Quart is that it’s not commonly used. So it will be tough to find recipes and accessories for this model. But, if you’re determined and ambitious cook, you can find anything for your Quart 8. So not a big deal! Quart 8 is taller than the Quart 6 pot. Well, it may be an issue to adjust taller cooker in cabinets. Another thing is you’ll have to move your taller cooker a bit away from the upper cabinet to direct the steam away from the upper cabinets. Whatever your choice may be, whether you choose the 6 Quart Instant Pot or the 8 Quart Pot, you’re going to prepare perfect, delicious and tasty food for your family. In my opinion, if your family is small and you don’t do batch cooking, go for 6-quart model and if you have large family or even a small family but you do batch cooking, go for 8-quart model. I love cooking, but fitting it into my busy schedule and family responsibilities is always a hard nut to crunch. So, I always look for simplified cooking methods – to continue to eat fresh and hygienic and feed my family well in a way that fits into our lives. For time-saving, nutrition and flavor, no cooking method beats today’s reliable and safe pressure cookers. You can get home at 8:00 and have a delicious, fresh, home cooked dinner on your dining table by 8:30 or even earlier. So ‘Wow’ is usually the exclamation you expect in conjunction with pressure cookers. Today, I’m going to talk about Instant Pot 8, so let’s start our journey. It’s a programmable cooker that can complete tasks including pressure cooker, sauté and browning, rice cooker, steamer, slow cooker, yogurt preparing and warmer. So, it completes seven different kitchen tasks. Is it not superb! It offers six times fast cooking than traditional cookers which helps to save 70% of energy. Save money along with tasty food. This multipurpose cooker comes with a luxury of 14 smart programs including sauté, chili/beans, meat/Stew, soup, steam, rice, porridge, slow cook, multigrain, poultry, yogurt, keep warm, manual and pressure cooker. So you can prepare your favorite food with just a click of a button. It’s based on 3rd generation sophisticated technology. It allows the users to fully control things like heat level adjustment, monitoring temperature, pressure, time and also maintain (keep-warm) the temperature of the food. In fact, you can enjoy different temperature settings to prepare different foods accordingly with ease and comfort. The ten safety mechanisms coupled with the certification of UL and ULC makes it completely safe and secure. So you’ll never experience any leakage or noise. It is made by pure stainless steel with food grade 304 standards. It is completely sealed with 3-ply bottom for even distribution of heat. These features help to prepare hygienic and healthy food all the time. You can easily clean it without any hassle. You don’t need to scrub the stainless because it is quite non-sticky. So here we are! 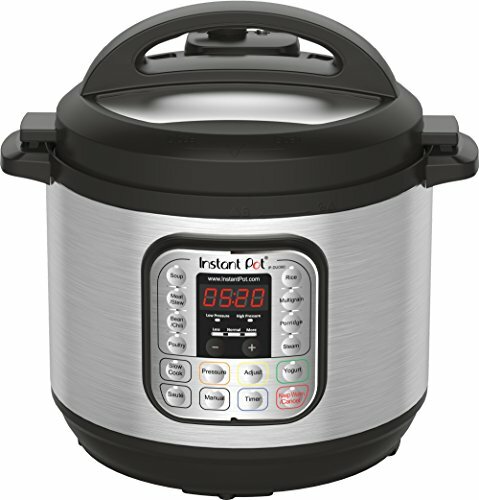 As a matter of fact, there are several other options for buying pressure cooker apart from Instant Pot 8. But if you’re looking for peace of mind, then, I think, you should go for this model without hesitation. What is the most important is its safety, multiple cooking and durability features. Such features make it the first choice of buyers. So why you should not give it a try!